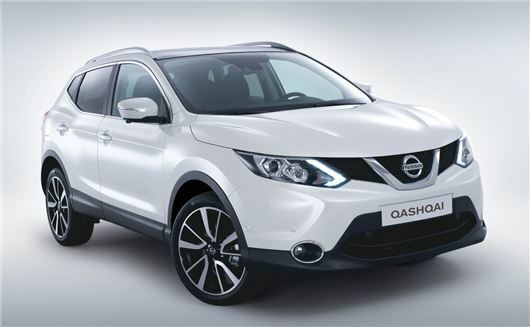 Order books for the second generation Nissan Qashqai have opened, with prices starting from £17,595. The first cars will arrive in UK showrooms in January 2014 and all cars get cruise control, air con, LED running lights and Bluetooth as standard. The Qashqai uses the same platform as the new Nissan X-Trail and is 20mm wider and 49mm longer than the outgoing model. Buyers get four trim levels to choose from - Visia, Acenta, Acenta Premium and Tekna – and there are three new turbocharged engines, with CO2 emissions varying from 99 - 129g/km. The entry level Visia trim gets 16-inch steel wheels, hill start assist and heated mirrors as standard, while Acenta models get automatic headlights, 17-inch alloys, dual air conditioning and rain sensing wipers. Acenta Premium adds Nissan’s infotainment system, with DAB radio and seven-inch colour screen, along with the manufacturer’s new front collision avoidance system. Qashqai Tekna gets Nissan’s new Safety Shield system as standard, which includes blind spot warnings, parking cameras and active monitoring to detect lane departure. There’ll be three engines available at launch – one petrol and two diesels – and all are coupled to a six-speed manual ‘box, with start/stop technology as standard. The range starts with the 110PS 1.5-litre dCI diesel unit, which emits just 99g/km of CO2 and returns a claimed 74mpg. The more powerful 1.6 dCi has 130PS and can be ordered with two or four-wheel drive. The 1.6-litre unit is, however, the only powertrain in the range that is offered with the option of seven-speed automatic ‘box. Emissions range from 119g/km of CO2 in two-wheel drive and rise to 129g/km with the four-wheel system. Fuel consumption is 61mpg, but drops to 57mpg with all-wheel drive. Nissan only has one petrol engine available - a new 1.2 DIG-T - which delivers 115PS and 190Nm of torque. Emissions are 129g/km of CO2 - 15g/km less than the outgoing 1.6-litre petrol unit – and fuel consumption is a claimed 50mpg. Nissan has created a new chassis control system for both the two and four-wheel drive versions of the Qashqai, to improve the car’s stability and control. Active ride technology monitors the wheel speed to detect any undulations in the car’s ride, while a new Active Trace Control system will keep an eye on the trajectory of the car and mimic a limited slip differential to improve traction and eliminate understeer. Hill start assist will also be included to make it easier to start the car on steep inclines. Hill start assist? No handbrake?